includes (VAV) first and second row all-weather floor mats, LPO, (VKN) third row all-weather floor mats, LPO and (VLI) all-weather rear cargo mat, LPO. (Not available with (CAV) Integrated cargo liner, LPO.) GMC Interior Protection Package Includes the following accessories:First and second row all-weather floor mats Third row all-weather floor mats All-weather rear cargo mats Not available with integrated cargo liner. 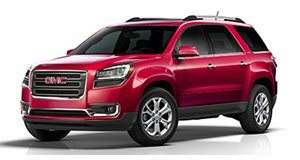 includes (UV6) head-up display, (RCA) cargo area audio system controls and (TVD) HID projector low beam headlamps (Requires (UVF) Forward Collision Alert and Lane Departure Warning. Included with (PCJ) Open Road Package.) Technology Package Includes: Head-up display, projects vehicle speed, engine speed, audio system settings and other vital info onto the lower windshield High-intensity discharge headlamps, cast bright, intense, whiter light to better illuminate signs and other objects down the road Rear cargo area audio controls Requires available Forward Collision Alert and Lane Departure Warning on SLT-2. includes (UI8) Color Touch Navigation radio with IntelliLink, (PDC) Technology Package, (UVF) Forward Collision Alert and Lane Departure Warning and (KB6) heated and cooled front seats *GROSS* Open Road Package SLT-2 includes: Color Touch Navigation1 radio with IntelliLink®2 upgradeable to Color Touch Navigation radio with IntelliLink2 and Rear Seat Entertainment Forward Collision Alert and Lane Departure Warning Heated and cooled front seats Technology Package includes head-up display, cargo area audio system controls and HID projector low beam headlamps 1 Map coverage excludes Puerto Rico, the Virgin Islands portions of Canada. 2 Full functionality requires compatible Bluetooth and smartphone, and USB connectivity for some devices. includes (UI8) Color Touch Navigation radio with IntelliLink, (C3U) Dual SkyScape sunroof, (UVF) Forward Collision Alert and Lane Departure Warning, and (V92) Trailering equipment (Included when (PCX) Premium Edition is ordered. (UI8) Color Touch Navigation radio with IntelliLink is upgradable to (UI7) Color Touch Navigation radio with IntelliLink and Rear Seat Entertainment.) *GROSS* Open Road Package SLT-1 includes: Color Touch Navigation1 radio with IntelliLink®2 upgradeable to Color Touch Navigation radio with IntelliLink2 and Rear Seat Entertainment Dual SkyScape sunroof Forward Collision Alert and Lane Departure Warning Trailering equipment Included when the Premium Edition is ordered SLT 2 includes: Color Touch Navigation1 radio with IntelliLink2 upgradeable to Color Touch Navigation radio with IntelliLink2 and Rear Seat Entertainment Forward Collision Alert and Lane Departure Warning Heated and cooled front seats Technology Package includes head-up display, cargo area audio system controls and HID projector low beam headlamps 1 Map coverage excludes Puerto Rico, the Virgin Islands portions of Canada. 2 Full functionality requires compatible Bluetooth and smartphone, and USB connectivity for some devices. includes (PEP) 4 - 20" x 7.5" (50.8 cm x 19.1 cm) aluminum wheels, (QQD) P255/55R20 H-rated blackwall tires and (PCJ) Open Road Package (Available with one of the following premium paints: (GB8) Ebony Twilight Metallic, (G1E) Crimson Red Tintcoat, (G1W) White Frost Tricoat or (G7U) Midnight Amethyst Metallic.) *GROSS* Premium Edition Includes:4 - 20" x 7.5" (50.8 cm x 19.1 cm) aluminum wheels P255/55R20 H-rated blackwall tires Open Road Package Available with one of the following premium exterior colors: Ebony Twilight Metallic, White Frost Tricoat, Crimson Red Tintcoat or Midnight Amethyst Metallic.